I am creating images for both web and print so I use pixels (px) and millimeters (mm) back and forth. But whenever I open the other type of file (i.e. opened web(px) first then print(mm), or print(mm) then web(px) ), the units displayed in Transform is always set to the previous file's setting. I have to go to "Document Setup > OK" or every time I encounter this. It is very frustrating. Is there anyway to fix it, or is it fixed in later versions of Illustrator? Thanks. Measurement settings are application wide and are not document specific. Just right-click, or control-click the rulers in the document and choose the scale you want. You can also input any scale into measurement fields. 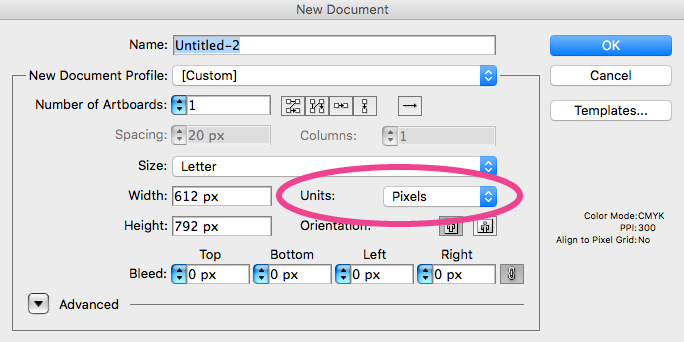 If the document is set to use pixels, you can input 50mm and it will automatically be converted to pixels. There's no need to keep changing preferences. File > New and then use the "Units" drop-down to select the units you prefer, then click the "OK" button. Not the answer you're looking for? Browse other questions tagged adobe-illustrator cs5 transform document-setup units or ask your own question. Illustrator CS6 saving as CS5 by default?